Wearing sack cloth and ashes, carrying photos of bombing victims, and holding one banner calling for repentance of the bombing and another banner which read: Why Harbor Evil Thoughts in Your Hearts? (Mt. 9:4), about 15 peacemakers held a mostly silent witness at the Pentagon. In between periods of silence we read the Transfiguration Gospel account and a short poem by Dan Berrigan, S.J. (see below), and offered a song about a Hiroshima child, I Come and Stand. Following the song, the group processed out of the fenced off designated protest area and six went onto the sidewalk near the Pentagon metro entrance and remained there to pray in silence. 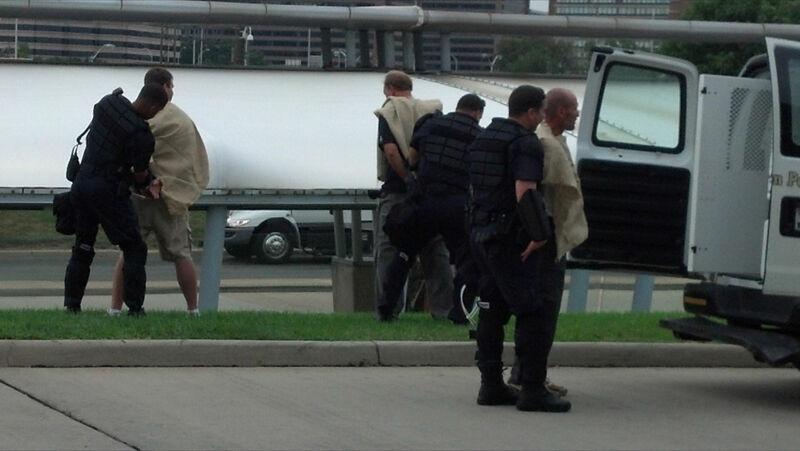 After several warnings the six were placed under arrest and taken to a new processing site on the Pentagon grounds, formerly used as a day care center. They were charged with violating a lawful order and released with a court date on October 19. At the Udvar-Hazy Museum about nine people held a solemn witness at the enshrined refurbished Enola Gay warplane to remember the victims of Hiroshima, and all victims of the nuclear age, and to call for the abolition of all nuclear weapons and war. As a banner was unfurled, security personnel immediately confiscated the banner. However we were allowed to hold several photos of Hiroshima victims. We ended the witness by offering Dan’s poem “Shadow on the Rock” and singing “I Come and Stand.” We were then escorted out of the building by security as we sang Child, Child. At this time in August, each year, rarely aided by media coverage, people around the world and across the country remember with solemn observances, gatherings, and demonstrations, the anniversary of the world’s first nuclear bombings – the U.S. atomic bombings of the Japanese cities of Hiroshima, August 6, 1945, and Nagasaki, August 9, 1945, in which more than 200,000 people were killed in the immediate blast and fire, and in the days, weeks, and years ahead died (indeed, continue to die) from the radioactive fallout poisoning from the two bombings. The bombings of Hiroshima and Nagasaki were an apocalyptic turning point in the violence and destruction that continues to grip humanity, and it was the United States that built and used the first atomic bombs. It was the United States that with the bombings announced its post-World War II imperial intentions around the world and permanent war economy here at home. War lay now as the central defining emphasis of U.S. culture, economy, and society. And so we remember, not simply because of the past but for the sake of the present and future which is the past now, over and over again. The Brandywine Peace Community has since its post Vietnam war formation in 1977 has spent every August 6 and August 9, in such public expressions of remembrance and acts of resistance to the hopeless lie that rests in nuclear weapons, and war. Remember and Resist has been the theme. 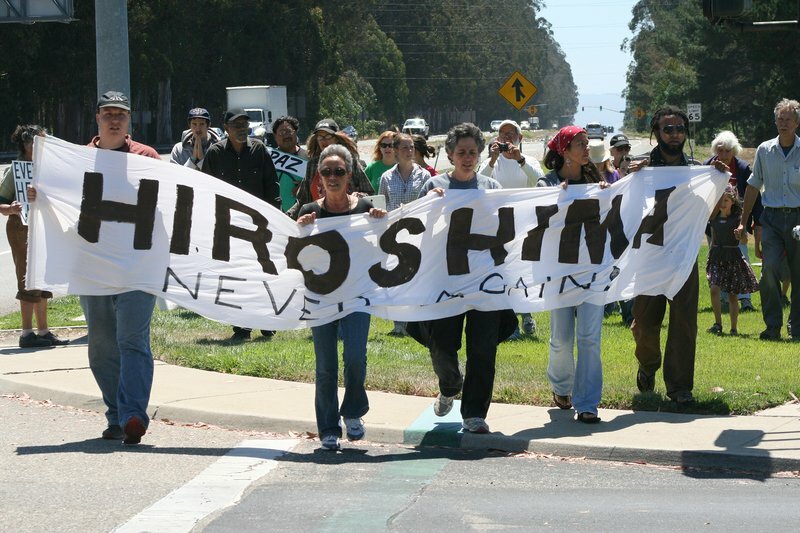 This week began with our August 6th, 2012, Hiroshima Day Observance and nonviolent protest at Lockheed Martin in King of Prussia, PA, site of our focus of nonviolent direct action focus throughout the year since 1993. Beginning at noon with a moment of silence for the victims of the violence and shooting sprees at the Sikh temple in Wisconsin and at the movie theater in Colorado, there in King of Prussia at the world’s largest war profiteer (and the U.S.’s chief nuclear weapons contractor, and among the largest producers of drone warfare technology for this new era of war in the nuclear age), our large bell tolls as ashes were spread at the company’s main driveway entrance, signifying a trail of ash and sixty-seven years of nuclear weapons and war. We broadcast an audio narrative about the development, testing and use of the first atomic bomb in which we hear J.Robert Oppenheimer, scientific director of the Manhattan Project which built the first atomic bomb, quote from the Hindu scripture, the Bhagavad Gita, “Now I am become death, the destroyer of worlds.” after witnessing the first test of an atomic bomb on July 16, 1945. We partake in a litany of memory, hope, and peace that includes the sharing of water in memory of the victims scorched in the blast and fire of the bomb, and scattering sunflower seeds, the international symbol of peace and a nuclear-free future, in front of the large Lockheed Martin sign. And we stand surrounded by a large pictorial display of the aftermath of the atomic bombings, a large wooden sign replicating the Lockheed Martin logo and reading: Lockheed Martin…WE’RE MAKING A KILLING! Seven of our small group gathered then stand in the main driveway entrance to the sounds of siren and a nuclear explosion before walking onto Lockheed Martin with signs connecting nuclear weapons with daily drone strikes. They then attempt to deliver pictorial packets from Japan showing the unbelievable aftermath of the atomic bombing sixty seven years ago. All seven – Bernadette Cronin-Geller, Father Patrick Sieber, Robert M. Smith, Mary Jo McArthur, of Philadelphia, PA; Anne Geers (92 years young), from Media, PA; and Tim Chadwick and Robert Daniels III, both from Bethlehem, PA – are (like so many, many times over the decades) are arrested and eventually released from the Upper Merion police station with citations for disorderly conduct. Remember and resist…Join us! Peace without end, Amen! Activists with Ground Zero Center for Nonviolent action held a peaceful early morning vigil at the Naval Base Kitsap-Bangor Main Gate as Navy and civilian employees entered the base. The vigil commemorated the atomic bombings of Hiroshima and Nagasaki. Peace activists lined the roadside with anti-nuke signs, banners and a full-scale inflatable Trident II D-5 ballistic missile. Around 7:00 am Peacekeepers from Ground Zero entered the road to safely stop incoming traffic. 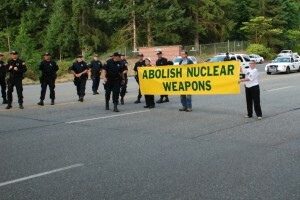 Three activists entered the roadway carrying a banner with the message “Abolish Nuclear Weapons.” Washington State Patrol officers escorted the protestors to the median for processing. Almost immediately, another group of activists entered the roadway with a banner bearing the message “Give Peace a Chance. 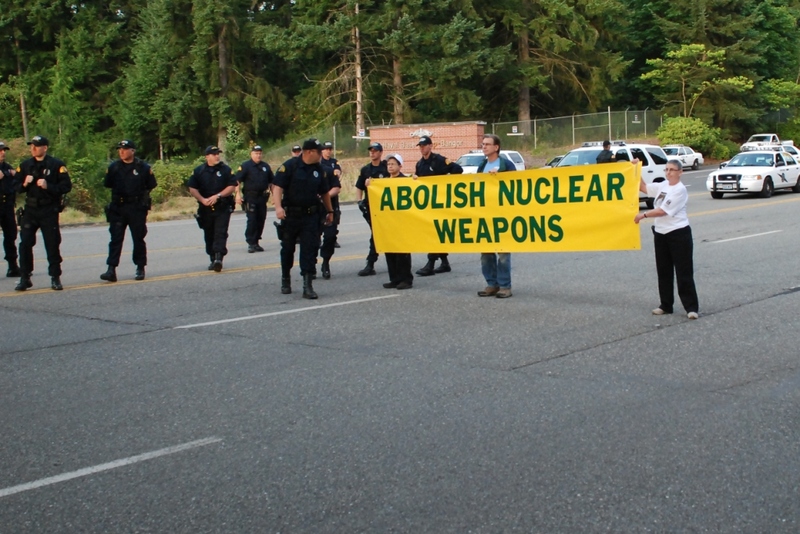 No, Seriously.” As they were being removed from the roadway two more groups carried banners calling for the abolition of nuclear weapons onto the roadway in the same sequence and were subsequently removed. Traffic entering the base was stopped continuously until all protestors were cleared from the roadway. A total of 16 persons engaged in the blockade. All were issued citations at the scene for “Walking on roadway where prohibited” and released. Those cited were Tom Rogers, Poulsbo, WA; Cindy Sheehan, Vacaville, CA; Marion Ward, Vancouver, WA; Michael Siptroth, Belfair, WA; Mal Chaddock, Portland, OR; Ann Havill, Bend, OR; Betsy Lamb, Bend, OR; Bernie Meyer, Olympia, WA; Leonard Eiger, North Bend, WA; Constance Mears, Poulsbo, WA; Gordon Sturrock, Eugene, OR; Brenda McMillan, Port Townsend, WA; Mack Johnson, Silverdale, WA; Gilberto Z Perez, Bainbridge Island, WA; George W Rodkey, Tacoma, WA and Elizabeth Murray, Bellingham, WA. During the vigil and action at Main Gate, another group from Ground Zero leafleted outside the Bangor Trigger Gate. The leaflets were titled “CAN WE TALK?” They explained that the peace activists were present to raise awareness of the danger of nuclear weapons, and invited recipients to join in a sincere dialogue on nuclear weapons. Activists handed approximately 200 of the leaflets to people entering and leaving the base. Monday’s vigil, nonviolent direct action and leafleting were the culmination of a weekend of events at Ground Zero Center. Participants commemorated the anniversaries of the atomic bombings and celebrated 35 years of Ground Zero’s resistance to the Trident nuclear weapons system. Participants had the opportunity to hear from Ground Zero co-founders Jim and Shelley Douglass, persistent peace activist Cindy Sheehan, and the (pepper sprayed) face of Seattle Occupy Dorli Rainey. The weekend included nonviolence training, letter writing to elected officials, action planning, a vigil at the Kitsap Mall and a screening of the documentary “In My Lifetime.” The film, a presentation of the Nuclear World Project, is intended to help people develop an understanding of the realities of nuclear weapons. A number of additional events were associated with the Ground Zero weekend. Glen Milner of Ground Zero organized this year’s Peace Fleet, a flotilla of boats that sailed into Seattle’s Elliott Bay on August 1st to meet the U.S. Navy fleet in a protest against militarism. Activists representing Physicians for Social Responsibility, Washington Chapter, arrived at Ground Zero on Saturday during the Bike to the Bomb bicycle ride. Bike to the Bomb protests the use of nuclear weapons against the people of Japan, and spotlights the massive nuclear arsenal stored and deployed at Bangor. Participants in the 2012 Pacific Northwest Interfaith Peace Walk for a Nuclear Free Future, which began in Portland, Oregon on July 22nd, also arrived at Ground Zero on Saturday to participate in the weekend’s activities. The walk is organized by Buddhist monks from Bainbridge Island, and carries a message of hope for peace and a nuclear free world. Ground Zero holds three scheduled vigils and actions each year in resistance to Trident and in protest of U.S. nuclear weapons policy. The group has been working to stop the Navy’s plan to build a $715 million Second Explosives Handling Wharf at Bangor, and recently filed a lawsuit in Federal court to stop the project. Ground Zero is also working to de-fund the Navy’s plans for a next generation ballistic missile submarine, estimated to cost $99 billion to build. 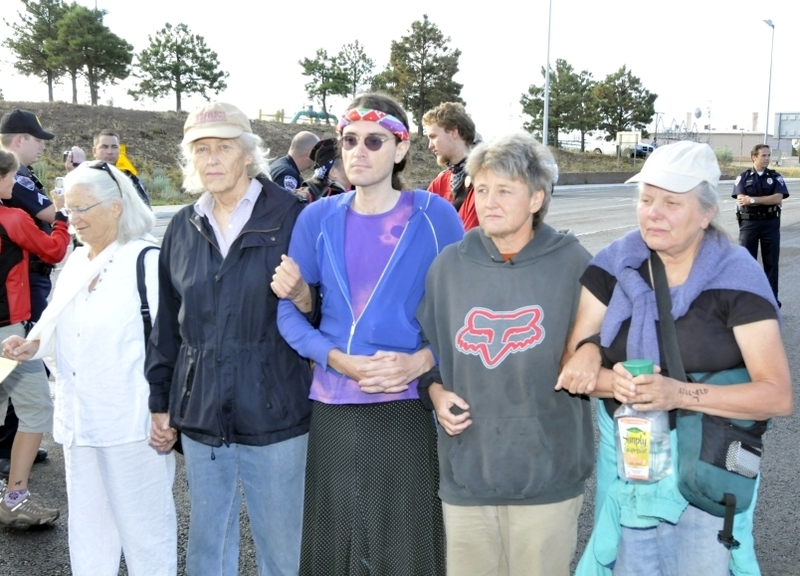 Six anti-nuclear activists were arrested at around 8 am on August 6 after blocking the road into Los Alamos National Laboratory. The action took place on the 67th anniversary of the nuclear bombing of Hiroshima. 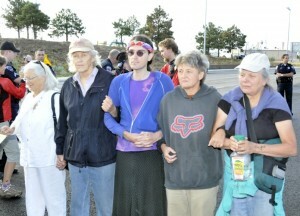 Around 50 activists from Trinity Nuclear Abolition and (un)Occupy Albuquerque participated in the protest. On August 6, the 67th anniversary of the Atomic bombing of Hiroshima, the Los Angeles Catholic Worker joined the Guadalupe Catholic Worker for a vigil and nonviolent direct action at Vandenberg AFB. Five Catholic Workers were arrested: David Omondi; Rebecca Casas;Tensie Hernandez-Apel; Barbara Robinson, and Theo Kayser. All were released over an hour later. Court appearance is pending.